The A-26, the last aircraft designated as an "attack bomber," was designed to replace the Douglas A-20 Havoc/Boston. It incorporated many improvements over the earlier Douglas designs. The first three XA-26 prototypes first flew in July 1942, and each was configured differently: Number One as a daylight bomber with a glass nose, Number Two as a gun-laden night-fighter, and Number Three as a ground-attack platform, with a 75-millimeter cannon in the nose. This final variant, eventually called the A-26B, was chosen for production. Upon its delivery to the 9th Air Force in Europe in November 1944 (and the Pacific Theater shortly thereafter), the A-26 became the fastest US bomber of WWII. 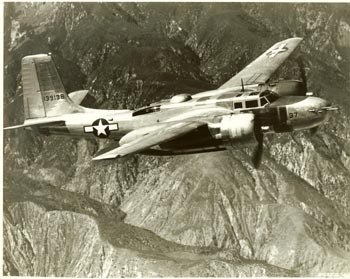 The A-26C, with slightly-modified armament, was introduced in 1945. Following the war, the A-26 was updated and adapted as the needs of the new U.S. Air Force changed. It is the only combat aircraft to see active service in World War II, Korea, and Vietnam. Photos were scanned from the personal album of Capt. Maurice Langford.